We have developed CyberSoft™ CafeTimer as Cyber Billing Software for manage your cyber easily. Following are our valued users who are currently running the CyberSoft™ CyberTimer 2.0, 3.0, 3.1, CyberSoft™ CafeTimer 4.0 and CyberSoft™CafeTimer 1.0. We hope your cyber will be also added in this list. This software display Internet Usage Time and Amount on server as well as client computer. By which, you and your customer easily can see the total usage time and the total amount for the Internet Usage. It can also Logoff, Restart, Shutdown your client computer from Server at anytime you want. It helps you to view periodically internet usage report of your client computers. CyberSoft™ CafeTimer shows Elapsed/Remaining time for particular computer(s) or user(s) in both Server (counter computer) and Client Computer. This software has some special feature by which client computer can be controlled from Server. Special features include: lock, unlock, logoff, restart, shutdown, prevent pressing ALT+CTRL+DEL etc. It is capable of recording extra activities like scanning, photo copies, use of telephone by customer during the internet usage period or other customers. Time for particular computer or all computer can be paused if any errors/disturbances occurred. This can be enabled from Configuration / Permission. It is now capable of terminating of program which is run by user after closing the session. As per requirement, time can be run clock-wise or anti-clock-wise. And add many timing option as well. In other word, time can be run for Post-Paid Session or Pre-Paid Session. It is designed for automatically resume last records including elapsed time, amount and other relevant information. Cursomers/Members of the cafe have their own login and password to start session. They can renew their accounts by paying to the staff. Various packages can be designed with fixed number of minutes and validity periods. The members can avail their usage and renewal reports when desired. This feature has been added for ultimate control of cyber cafe. Temporary Members are member for temporary time i.e. maximum of 5 days and/or 3 hours validity. This is like PrePaid member system but temporary members can not renew their accounts. It is separate feature from PostPaid/PrePaid member system. This is like a coupon with unique username, password, total minute and validity period. This feature has been added for ultimate control of cyber cafe. 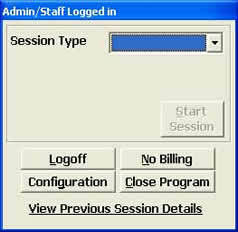 Supports manual billing in the form of dummy clients to time Xbox, Laptops, Pool Tables or anything else in your cafe. Chatting between the server and client computers now enable the customers to request services without ever getting out of their chairs. Send message to all feature enables the operator to broadcast announcements to all users in the cybercafé simultaneously. Cash discounts can be given to postpaid customers in case their was a lapse in the service provided by the cafe (typically, a break in the Internet connection etc.,) And for the prepaid customers, their minutes can be adjusted. A report showing all the records where adjustments were made can be availed to query the staff on each adjustment given. If all the client computers are occupied by the customers, the server machine can be switched to the CLIENT-MODE and given to a customer. All the clients keep functioning even if the server goes down for a long period of time. Sometimes, some applications may not be present in some computers but present in others. 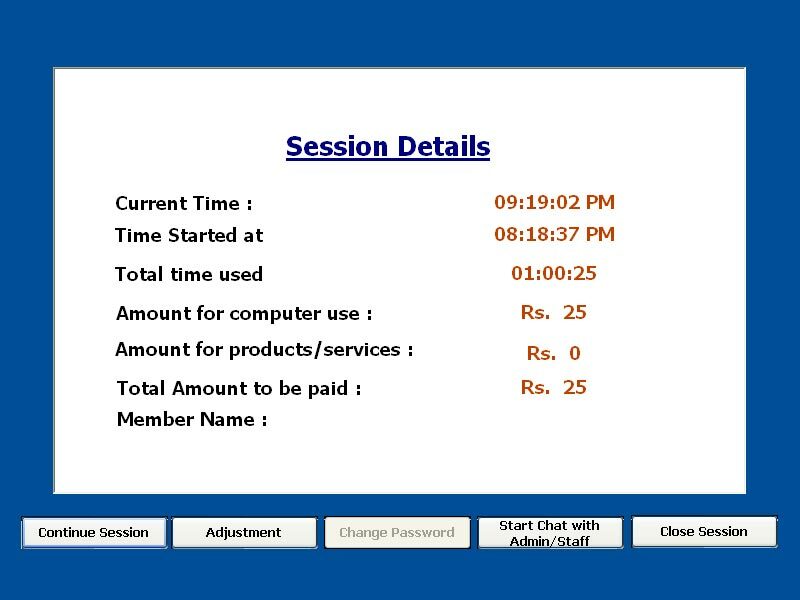 The customer may want to switch to a different computer in the middle of his session, and with the transfer session feature of CyberSoft™ CafeTimer this becomes very easy. Different staff members can be given different access rights with regards to the operation of CyberSoft™ CafeTimer. to know more, please contact us or download CyberSoft™ CafeTimer. How can we authenticate with CyberSoft™ CafeTimer ? How can we do Client Configuration? Can we change the Usage Rate? Can we add new user for CyberSoft™ CafeTimer ? Can we view Log of Internet usage by customer? Can we change the password? Can we backup database of CyberSoft™ CafeTimer ? Can we restore database of CyberSoft™ CafeTimer ? How can we get registered version of CyberSoft™ CafeTimer ? Can we again get registered version in case of any problem ? How much does it cost for get registered version ? Is there service period for software maintenance ? How much does it cost for software maintenance ? Is there any support except field visit ? How can we close the program which is opened during the session ? Why time and amount can not displayed? How can we change the server name? 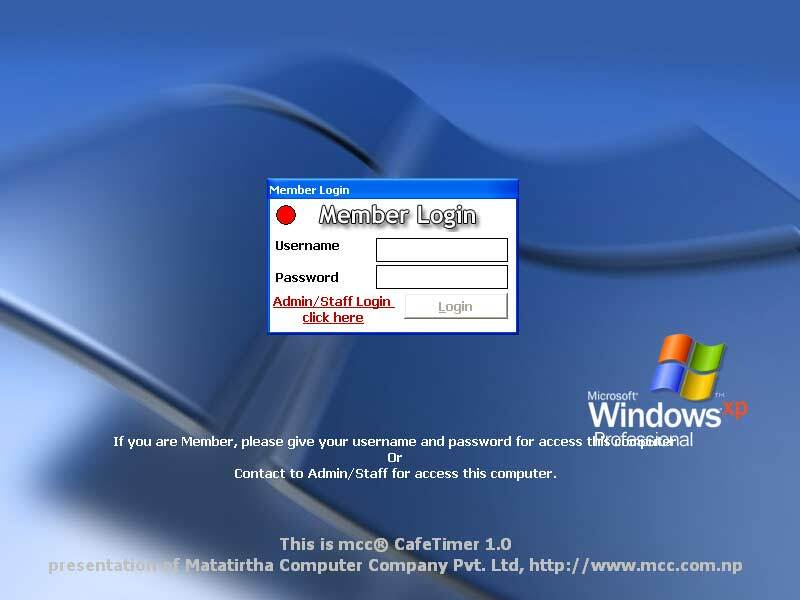 CyberSoft™ CafeTimer needs authentication for taking necessary action like start time, stop time, view log etc. For authenticate, Click on File ---> Login and supply correct username and password (for the first time username and password has been fixed as "demo"). This version, automatically add client computer after getting connection from Client Computer. If you want to display your client serially, click on General Administration-->Client Computer Management and Enter the Client Computer name as shown as Network Neighbourhood. Yes, you can do it anytime you want. 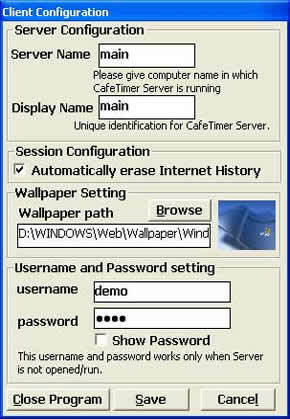 For this, you must be authenticate with CyberSoft™ CafeTimer either as Super Admin or as Normal Admin. Normal User can't change the usage rate. After authenticate, Goto General Administration --->Rate Management and Enter the amount properly. Please remember don't leave any field Zero (0). Can we add new user for CyberSoft™ CafeTimer? Yes, you can do. For this, you must be authenticate. After authenticate, Goto Staff Management --->Admin/Staff Management and add User with appropriate rights. Yes, you can do. For this, you must be authenticate with appropriate right. After authenticate, Goto Reports --->View Reports and Select the Report Type. You can choose any of the available option as per your requirement. Yes, but only Super Admin can change the password of all user. Advance Configuration is a feature which is included here for your easiness. Don't Save Log when Time is less than 1 minute --> If this option is selected then software never save log when usage time is less than 1 minute. Automatic Start Program when Computer Runs --> If this option is selected then software will automatically run when windows is opened. (can't changed by user). What will do in Client after Stopping Time ? --> If this option is selected, the server will send appropriate option for Logged off, restart or shutdown for the client. Display Pause Time --> This option is introduced here for enable/disable the Pause Time menu. When this enabled, pause time menu will be display. This option is very useful when you want to pause the time due to some reason on particular client computer. Display Adjust Time --> This option is introduced here for enable/disable the Adjust Time menu. When this enabled, Adjust Time menu will be display. This option is very useful for those who don't want to change the time. Display Logoff --> This option is introduced here for enable/disable the Logoff menu. When this enabled, clicking on this menu will Logoff selected Client Computer. Display Restart--> This option is introduced here for enable/disable the Restart menu. When this enabled, clicking on this menu will Restart selected Client Computer. Display Shutdown--> This option is introduced here for enable/disable the Shutdown menu. When this enabled, clicking on this menu will Shutdown selected Client Computer. Yes, you can do this with enough rights for backup. Only Super Admin can backup the database. After authenticate, click on General Administration ---> Database Backup and select the folder in where your backup should be lies and click on Button. System will automatically copied database in specified folder and display the folder address in Message Box. We recommend that always make backup of your database after opening your computer. Yes, you can do this with enough rights for backup. Only Super Admin can restore the database. After authenticate, click on General Administration ---> Database Restore and select the folder in where your have kept the backup of database and click on Button. System will automatically copied database in appropriate folder. You can get licensed software from CyberSoft.Com.Np (http://www.cybersoft.com.np). After installing CyberSoft™ CafeTimer, click on Start Menu --> Program --> CyberSoft™ -- > Send Purchase Request and fill up the form. After receiving your request, you will be contacted from us as soon as possible. About-->Register Program and wait for some while software download necessary information from internet and registered again the software. Yes, we offer 1 month software maintenance period from the date of Registered. we does not charge any cost within software maintenance period. After expiration of software maintenance period, we will charge NRs. 500.00 per field visit within the Kathmandu Valley. Yes, online support can be found on MSN. Just add info@cybersoft.com.np/me@sunil.com.np as your MSN for support. Just Enable "Close all Program on Client" option in respect client. OR Mark as "Close all Program on Client" when starting a new session. This is happened if client software cannot connect to server software or some error in your network. Please check the network cable. After Admin/Staff login in client, go to Configuration and Change the ServerName.